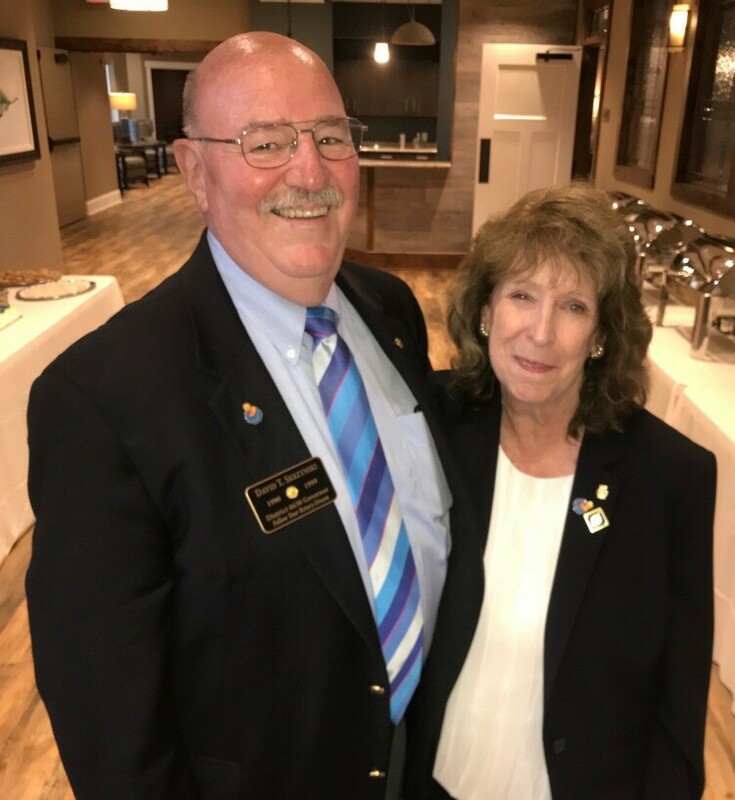 It is hard to believe how quickly the first three months of the 2018-2019 Rotary year have simply flown by – something that each and every Past District Governor warned me about. This phenomenon happened when I was a Club President, so I guess I shouldn’t be surprised - so none of the 2018-2019 Presidents of Action should be either. I would not take back a moment, though I wish sometimes there were more hours in the day and I had the ability to be in more than one place at a time. That is the hardest part for me – to not be able to attend all of the incredible club events and projects that are occurring each and every week in this district. I have completed two-thirds of my club visits as of this writing, or 34 of 53. I will regret when they are over. If everyone in this district could look “through my eyes for a brief moment” – they would be overwhelmed by and disbelieving of the number of humanitarian projects there are and have been in District 6630 since its inception and the millions of people whose lives have been made better for having been touched by Rotary. It is life-changing to even think about and something I am in awe of each and every day. Our Club Presidents are energetic, “forward thinking” and engaged as agents of inspiration and change for their clubs and communities. This is a changing world; we must be prepared to change with it. The story of Rotary will have to be written again and again. — Paul P. Harris, Founder, Rotary International. 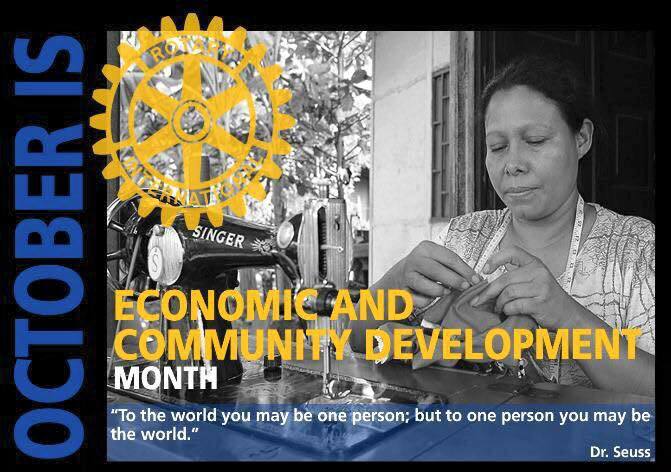 October is Economic and Community Development Month and Rotary International shares the following: Nearly 1.4 billion employed people live on less than $1.25 a day. Our members promote economic and community development and reduce poverty in underserved communities through training, well-paying jobs, and access to financial management institutions. Projects range from providing people with equipment to vocational training. Our members work to strengthen local entrepreneurs and community leaders, particularly women, in impoverished communities. This is woven into the mosaic of all of our clubs and takes many different forms whether within our own communities or serving a need across the ocean. That is Rotary and that is what our clubs do. World Polio Day was established by Rotary International over a decade ago to commemorate the birth of Jonas Salk, who led the first team to develop a vaccine against poliomyelitis. In less than two weeks, on October 24, Rotarians from around-the-world will come together “as one” for this year’s commemoration to continue to place emphasis on the elimination of this crippling and debilitating disease. Please see the different articles included in this newsletter not only detailing the history of Polio Eradication, but also answering some common questions from Rotarians on the Global Polio Eradication Initiative (GPEI). In the coming days you will receiving information on a special initiative that has been launched in our district on Polio Eradication. In conclusion, I want to share some thoughts with you from my husband, PDG Dave, on Polio eradication. He actually will probably be quite surprised to see it appear here with his byline. As I reflect on World Polio Day, October 24, 2018, I find Rotary's investment amazing. If you ask almost any Rotarian they will say PolioPlus started in 1985 and that is true. Others may say it started in 1979 when 6 million children in the Philippines were vaccinated with a grant from Rotary, that is also true. However, if you look into the history of our Rotary District alone, you will find that the effects of Polio were foremost in the minds of Rotarians and their Clubs. Without exception every Rotary Club chartered before 1960 and most chartered after that, supported significant programs for children crippled by Polio. From Camp Cheerful and Akron Rotary Camp to major support of local county schools for crippled students, and in one case inventing and producing self-powered wheelchairs to provide mobility to those not able to walk. Even as we approached the New Millennium and Polio had been eradicated from the Americas, Rotarians of District 6630 never took their focus away from this debilitating disease. Some traveled overseas to administer vaccines, some sent wheelchairs, crutches and other equipment to help those already affected and just as important most raised or gave money so that all of these efforts were possible. It is believed that Polio has been affecting humans for 3,000 years and untold millions of children. Thanks to Rotarians around the world, just like us in Northeast Ohio, we are only 19 cases away from removing this terrible disease from the face of the earth. Please take the occasion of World Polio Day to make others aware of these efforts, and the importance of eradicating this debilitating disease.